Thanks to our good friends at Mozilla, WikiMedia Foundation and Primary Technology we are proud to announce really-real time collaborative Slideshow presentations powered by Etherpad! 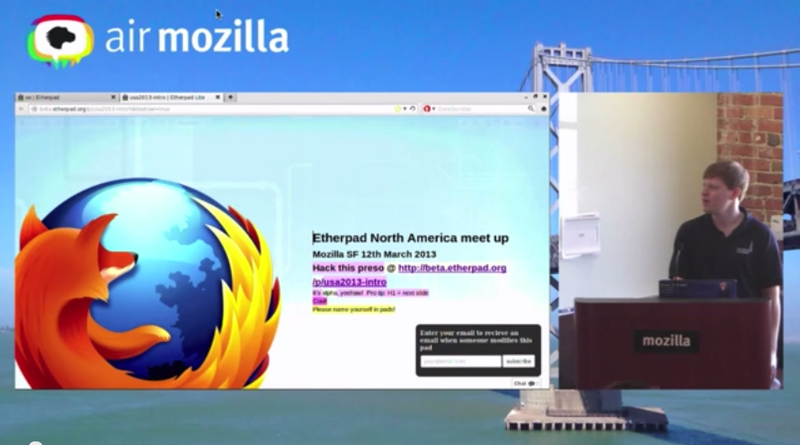 John McLear demonstrates a beta version at Mozilla earlier this year. Have a go with Slideshows yourself. Visit the slideshow plugin repository on Github to begin contributing! Get Etherpad now, it’s super easy to install, free and open source! Infradoom is a patch release to support broken session logic caused by an express update. Infradoom also has various other nice bits, bug fixes and patches. Show other authors, markdown editing and export, text alignment and more great new plugins..
Like how Google Docs shows where other authors are on the document? Well Etherpad also has that functionality and it’s only a few clicks away! Grab ep_cursortrace from your /admin/plugins page. Who doesn’t love Markdown? With ep_markdown you can use rich editing buttons and see rich edits and markdown together or toggle between markdown/up visibility. It’s really nice and a useful addition to Etherpad. Grab ep_markdown from your /admin/plugins page. Left, Center, Right and Justify Text in your pad. Great when paired up with ep_page_view for a richer editing experience. Grab ep_align from your /admin/plugins page. Stop Writing is a plugin for teachers and other pad owners to stop collaborators for writing, possibly to partake in a discussion or other announcement. Grab ep_stop_writing from your /admin/plugins page. Pad Stats is a commercial plugin but still really cool. Get stats such as Character Count, Word Count, Revision Count, Saved Revision count and various Author Statistics. Mostly a bugfix release but we also introduce some new support and features, from the changelog. We’re starting to gear up for 1.3 now and we have introduced a voting system for features. * NEW: Ctrl S for save revision makes the Icon glow for a few sconds. * NEW: Plugin page revamp makes finding and installing plugins more sane. * Fix: Server wont crash on import fails on 0 file import. Some feature you want hasn’t been made yet? Get voting!